Smith, Derek G.. "Handsome Lake Religion". The Canadian Encyclopedia, 29 November 2016, Historica Canada. https://www.thecanadianencyclopedia.ca/en/article/handsome-lake-religion. Accessed 22 April 2019. Handsome Lake Religion is the religion practised by some Haudenosaunee communities in Canada and the US. Its adherents are known as "the Longhouse people" because ceremonies are held in a building called the longhouse. Handsome Lake Religion is the religion practised by some Haudenosaunee communities in Canada and the US. Its adherents are known as "the Longhouse people" because ceremonies are held in a building called the longhouse. Its beliefs and practices are a blend of ancient Aboriginal traditions and innovations introduced by the Seneca prophet Handsome Lake who preached from 1799 until his death in 1815. In Canada the Handsome Lake Religion is represented on reserves at Kahnawake (near Montréal), Grand River (near Brantford), Oneida (on the Thames River) and St Regis (near Cornwall). The religion is a combination of traditional Aboriginal ceremonies and Christian messages about salvation and avoidance of sins. Abbreviated versions of the Gaiwiio, "the good words" or the Code of Handsome Lake, are recited at the Green Corn Festival in late August or early September and at the Midwinter Ceremonial in January or February. 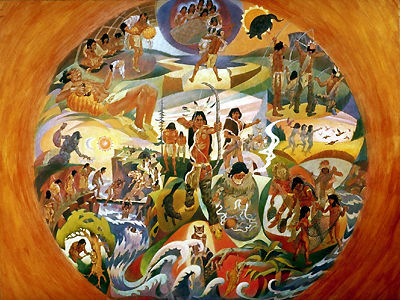 In the autumns of alternate years the Gaiwiio is recited in full at a solemn convocation of the Six Nations (Iroquois Confederacy) by designated speakers. Each speaker holds a bundle of wampum strings as his credentials, regalia acquired from his predecessors in office who taught him the Gaiwiio. Other rites such as the Great Feather Dance, the drinking of strawberry juice, commentaries on the Gaiwiio, and public confessions of moral lapses are performed. Members may also attend other Aboriginal religious rites and Christian churches. The teachings of Handsome Lake played an important role in reconstructing Iroquois society after an almost complete collapse of the social and cultural order in the late 1700s. See also Indigenous People: Religion and Spirituality. A.F.C. Wallace, The Death and Rebirth of the Seneca (1972).